“Accessibility is the degree to which a product, device, service, or environment is accessible to individuals with disabilities or other special needs. Why are we passionate about accessibility? We aim to be the model for an inclusive organisation and believe everyone should have same access to our data and information, regardless of if they use assistive technology or not. Our “Better statistics, better decisions” strategy outlines the need to make our information accessible to all. In Digital Publishing, we also believe accessibility improvements to our website and social media channels make content better for all users. This is why we testing for accessibility in all our work. We also get disability groups involved whenever we change anything (including website developments, social media or developing our intranet). Often, when talking about digital accessibility, people think of screen readers. There are four types of needs people may have when using social media or the web. Here are these four types and some examples. People with visual needs may have additional needs due to complete blindness, partial blindness, colour blindness, or they may use zoom due to being long sighted. People with hearing needs could be deaf or suffer with degrees of hearing loss. This could be in one or both ears. People with cognitive needs may include autism, Down Syndrome, traumatic brain injury (TBI), dementia, attention deficit disorder (ADD), dyslexia (difficulty reading), dyscalculia (difficulty with math), and learning disabilities in general. People with motor needs can include cerebral palsy, muscular dystrophy, multiple sclerosis, spina bifida or ALS (Lou Gehrig’s Disease). This category for digital accessibility includes people who may have difficulties using a mouse or keyboard such as those with limited use of their hands or fingers or people with arthritis. It’s important to recognise, not all disabilities are permanent which strengthens the rationale that making social media or websites more accessible is better for everyone. Below are some examples of temporary or situational accessibility needs. Someone suffering with an eye infection, having a temporary eye injury or using a mobile device in sunlight may have different needs on their device to be able to see the screen or understand the information- it may be they need to adjust their screen brightness or they could use screen reading software to get information. People may watch videos without sound or may be in an environment it isn’t possible to hear the audio content online. This is where subtitles and audio description is useful to many people, not just those who are deaf. Last year, we shared social media accessibility standards for the first time in UK government (and we’re yet to find any that existed before this). 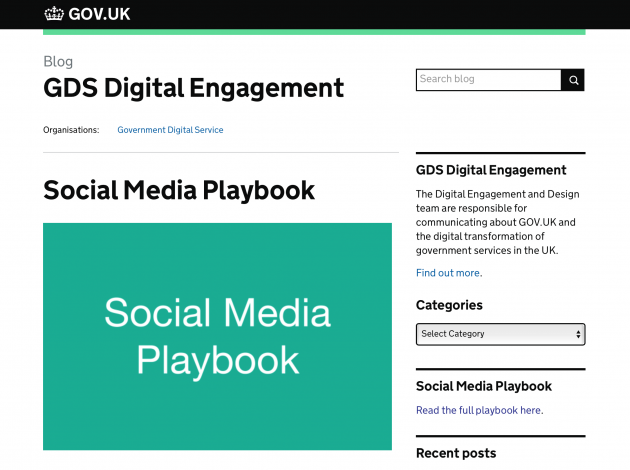 These standards, with some guidelines are published in the GDS Social Media Playbook and cover written content; images, animated GIFs and infographics; video and audio content; live streaming; and advice on using hashtags and links. As a summary, here are five top content tips to make your social media content accessible. Aim for a 9-year-old’s understanding when sharing content on social media. This will help to remove jargon, acronyms, technical language or industry terms and make your content better for everyone to understand. It’s not easy to make content that is easy for everyone to understand but every step towards making it easier is great! 2. Make your images as accessible as possible. If there is the option to use alt tags (for example,. Twitter mobile apps), please do. There are guidelines for colour contrasts available and if you do use text inside your images, pop them on a plain background. Adding a link to a webpage for more information gives people using assistive technology a way to read the content in HTML and also gives people more information than in the social media post. Hyperlinks can also be useful to link content together or give context to a post. Please keep links and hashtags to a minimum (we’ve all seen spammy social media posts with lots of hashtags in a bid to get more eyes on the post!) as people using assistive technologies or keyboard tags to navigate can find it difficult to get through the links. Another top tip for including links in social media posts is to ensure the copy clearly tell the user where the link will take them (avoid clickbait!). If you are sharing video content, include captions and audio description. This opens the content up to everyone and not just those with hearing impairments. Research shows up to 85% of people no longer have the sound on when watching videos online. 5. Only use a GIF if it adds value to the content. During our user research for the social media accessibility guidelines, we found that people with some cognitive or visual impairments find GIFs difficult to engage with and may distract users from the message. Therefore, although they can be fun and pretty, only use GIFs if they help with your messaging or add value to the content.